College is a great and enriching experience. Not only did you get to choose to study the things you love, but now you have the opportunity to take your degree and make a living from your new skills. There’s just one question holding you back. What about my student loans? Many students live in fear of the upcoming and ever-looming threat of student loans. Already in debt and no job right from the start. That’s terrifying but it’s not as bad as you may think. With a little help from your loan officer and this template, you can make manageable monthly payments while you live the life you love. After speaking with your loan officer for the first time, you’ll probably feel a lot better about your debt. 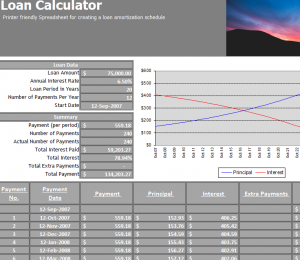 The free Loan Calculator Template will help you calculate and track your student loan payments and show you in multiple ways how long it will take to pay off your debt. You can even play around with the figures to pay it off even faster. The first step, after downloading the Student Loan Calculator, is to enter all your loan information at the top. Start by entering the amount you owe, annual interest rate, the loan period, number of payments, and the start date of your payments. Everything else will be calculated for you below. Scroll down to the long list of payments below. You’ll see that your payments, from start to finish, are listed for you to review. You can change any of these as you go and the template will automatically adjust for your summary at the top. You can review all your student loan information in the “Summary” section of your Loan Calculator. There is also a helpful graph to provide you with a quick overview from a glance. The graph will display the amount you pay the principle amount and your interest. Don’t be discouraged by your student debt. Most people in the United Sates live with it and many people consider it to be positive debt because it can potentially add to the quality of your life and provide you with greater earning potential. Simply pay your monthly installments on time and you’ll be free to do whatever your passion is in life.